While holding the crucifix make the Sign of the Cross. and then recite the Apostles Creed. Recite a Hail Mary for an increase of faith, hope and charity on each of the three small beads, in honor of the Trinity (Father, Son, and Holy Spirit). On the next large bead, recite the Glory Be to the Father and the Fatima prayer. Each succeeding decade is prayed in the same manner by recalling the appropriate mystery, reciting the Our Father, ten Hail Mary’s while reflecting on the mystery, the Glory Be to the Father, and the Fatima prayer. After choosing a set of mysteries (using the above charts), meditate on each mystery. For pictures to aid in your meditation, click on one of the links to the left: Joyful, Luminous, Sorrowful, or Glorious. The body of the above prayers of the Rosary are below. The Sign of the Cross: In the name of the Father, and of the Son, and of the Holy Spirit. Amen. The Apostle's Creed: I believe in God, the Father Almighty, Creator of heaven and earth; and in Jesus Christ, His only Son, our Lord; Who was conceived by the Holy Spirit, born of the Virgin Mary, suffered under Pontius Pilate, was crucified, died and was buried. He descended into the world of the dead; and on the third day He rose again. He ascended into heaven and sitteth at the right hand of God, the Father Almighty; from thence He shall come to judge the living and the dead. I believe in the Holy Spirit, the holy Catholic Church, the communion of saints, the forgiveness of sins, the resurrection of the body, and life everlasting. Amen. Our Father: Our Father, Who art in heaven, hallowed be Thy name, Thy kingdom come, Thy will be done on earth as it is in heaven. Give us this day our daily bread; and forgive us our trespasses, as we forgive those who trespass against us. And lead us not into temptation; but deliver us from evil. Amen. Hail, Mary: Hail, Mary, full of grace, the Lord is with thee; blessed art thou among women, and blessed is the fruit of thy womb, Jesus. Holy Mary, Mother of God, pray for us sinners, now and at the hour of our death. Amen. The Joyful Mysteries - With the introduction of the new Mysteries of Light, the Joyful Mysteries are now said on Mondays and Saturdays, and focus on the early life of Jesus. 1. The Annunciation - The angel of God appears to Mary and tells her she is to be the Mother of God - (pray for the virtue of humility). 2. The Visitation - Mary, on hearing of Elizabeth's own pregnancy, goes to visit with her cousin - (pray for the virtue of charity). 3. The Birth of Our Lord (the Nativity) - Away from home and with nowhere to stay, Mary and Joseph welcome Jesus into the world - (pray for the virtue of poverty). 4. The Presentation - Mary and Joseph present Jesus to His Heavenly Father in the temple 40 days after His Birth - (pray for the virtue of obedience). 5. The Finding in the Temple - After searching for three days, Mary and Joseph find the 12-year-old Jesus sitting among the learned doctors of the temple - (pray for the virtue of piety). The Luminous Mysteries - Said on Thursdays, these mysteries focus on the life of Christ during His ministry on earth. 1. The Baptism of Our Lord - As Christ descends into the waters, the heavens open wide and the voice of the Father declares Him the beloved Son, while the Spirit descends on Him to invest Him with the mission which He is to carry out - (pray for the virtue of detachment from the world). 2. The Wedding Feast at Cana - The first of the signs, given at Cana, is when Christ changes water into wine and opens the hearts of the disciples to faith, thanks to the intervention of Mary, the first among believers - (pray for the virtue of trust in God's will). 3. Jesus Proclaims the Kingdom of God - Jesus proclaims the coming of the Kingdom of God, calls us to conversion, and forgives the sins of all who draw near to Him in humble trust. These are the inauguration of the ministry of mercy which He continues to exercise until the end of the world, particularly through the Sacrament of Reconciliation - (pray for the virtue of desire for holiness). 4. The Transfiguration - During the Transfiguration the glory of the Godhead shines forth from the face of Christ as the Father commands the astonished Apostles to “listen to Him” and to prepare to experience with Him the agony of the Passion, so as to come with Him to the joy of the Resurrection and a life transfigured by the Holy Spirit - (pray for the virtue of spiritual courage). 5. The Institution of the Eucharist - At the Last Supper we see the the institution of the Eucharist, in which Christ offers Body and Blood as food under the signs of bread and wine, and testifies “to the end” His love for humanity, for whose salvation He will offer Himself in sacrifice - (pray for a greater virtue of devotion to Jesus in the Blessed Sacrament). The Sorrowful Mysteries - Generally said on Tuesdays and Fridays, these mysteries focus on the suffering and death of Jesus. 1. The Agony in the Garden - The thought of our sins and His impending, horrible death make Jesus sweat tears of blood - (pray for the virtue of contrition). 2. The Scourging at the Pillar - Jesus is stripped of His clothing and dignity and is lashed repeatedly leaving His body a mass of bloody wounds - (pray for the virtue of purity). 3. The Crowning of Thorns - Jesus is ridiculed for claiming Kingship when they place a crown of thorns on His head - (pray for the virtue of courage). 4. The Carrying of the Cross - Jesus shoulders His own cross, carrying it and dragging it to Golgotha, our sins were the weight of that cross - (pray for the virtue of patience). 5. The Crucifixion of Our Divine Lord - After three hours of agony, watched by His Beloved Mother, Jesus dies - (pray for the virtue of self-denial). The Glorious Mysteries - Said on Wednesdays and Sundays, these mysteries focus on the whole purpose of the life and death of Jesus, His glorious resurrection and our redemption from sin and the place of honor accorded to His Blessed Mother, Mary. 1. The Resurrection - Jesus rises from the dead three days after His crucifixion as He had said He would - (pray for the virtue of faith). 2. The Ascension - 40 days after His Resurrection, Jesus ascends into Heaven to sit at the right hand of His Father, there to judge the living and the dead at the end of the world - (pray for the virtue of hope). 3. The Descent of The Holy Spirit - Jesus sends the Holy Spirit on His apostles and disciples in the form of fiery tongues - (pray for the virtue of charity to others). 4. The Assumption - Our Lady's soul returns to God and her glorified body is assumed into heaven - (pray for the gift of eternal happiness). 5. The Coronation - Mary is crowned Queen of Heaven and Earth, of Angels and Saints, to rule over our lives forever and into eternity - (pray for the greater devotion to Mary). The word Rosary means "Crown of Roses". Our Lady has revealed that each time someone prays a Hail Mary, they are giving her a beautiful rose and that each complete Rosary makes her a crown of roses. The rose is the queen of flowers, and so the Rosary is the rose of all devotions and it is therefore the most important one. The Holy Rosary is considered a perfect prayer because within it lies the awesome story of our salvation. During the Rosary we meditate on the mysteries of joy, of sorrow, of faith, and of the glory of Jesus and Mary. It's a simple prayer—one we can all say together with Her, the Mother of God. With the Hail Mary we invite Her to pray for us. Our Lady always grants our request. She joins her prayer to ours. Jesus can never say no to whatever His Mother asks. In every one of her apparitions on earth, the heavenly Mother has invited us to say the Rosary as a powerful weapon against evil, to bring us to true peace. With your prayer, joined with our heavenly Mother, you can obtain the great gift of bringing about a change of hearts and conversion. Each day, through praying the Rosary you can drive away many dangers and evils. It can seem a repetitive prayer but instead it is like two sweethearts who many times say one another the words: "I love you"... St. Pope John Paul II, on October 16, 2002, by way of his Apostolic Letter, Rosarium Virginis Mariae, (“On the Most Holy Rosary”) added five new mysteries of the Rosary: the Luminous Mysteries, also known as the Mysteries of Light. 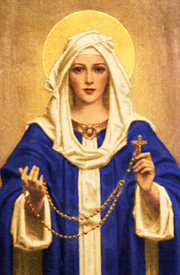 Venerable Archbishop Fulton Sheen said, "The rosary is the book of the blind, where souls see and there enact the greatest drama of love the world has ever known; it is the book of the simple, which initiates them into mysteries and knowledge more satisfying than the education of other men; it is the book of the aged, whose eyes close upon the shadow of this world, and open on the substance of the next. The power of the rosary is beyond description." The rosary has been written about by both saints and popes and continues to be mentioned in reported Marian apparitions. The Virgin Mary has made 15 specific promises to those who pray the Rosary. The Fifteen rosary promises range from protection from misfortune to meriting a high degree of glory in heaven. In the 18th century, the French priest, Fr. Louis de Montfort, elaborated on the importance of the rosary and its power in his book, Secret of the Rosary. 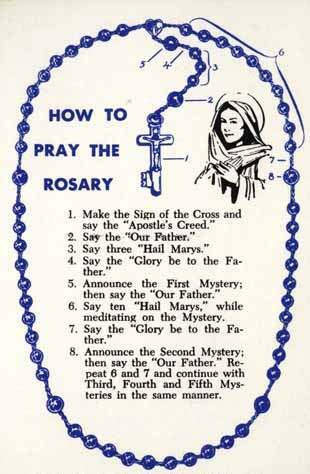 He emphasized the power of the rosary and provided specific instructions on how it should be prayed, e.g. with attention, devotion, and reverence, with reflective pauses between the beads and smaller pauses between the phrases of the prayers. One of the forces that drove the spread of the rosary during the 19th century was the influence of the Rosary Pope, a title given to Leo XIII (1878–1903) because he issued twelve encyclicals and five Apostolic Letters on the rosary, as well as instituted the Catholic custom of daily rosary prayer during the month of October. Pope Leo XIII said that the rosary was a vital means to participate in the life of Mary and to find the way to Christ. He called the Rosary a “path through Mary to Christ.” The Rosary as a family prayer was supported by Pope Pius XII in his encyclical Ingruentium malorum, in which he said, "The custom of the family Rosary is a most efficacious means to live a Christ-like life." The rosary beads provide a physical method of keeping count of the number of Hail Marys said as the mysteries are contemplated. The fingers are moved along the beads as the prayers are recited. By not having to keep track of the count mentally, the mind is free to meditate on the mysteries. Although counting the prayers on a string of beads is customary, the prayers of the rosary do not actually require a set of beads, but can be said using any type of counting device, by counting on the fingers, or by counting without any device at all.